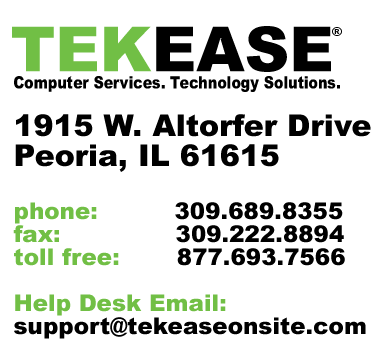 TEKEASE is headquartered in Peoria, IL. TEKEASE is a premier technology solutions provider with a focus on serving residential clients and small to medium-sized business. We pride ourselves in being At the Intersection of Business and Technology™ by providing affordable solutions which align with our clients business purpose. Through a consultative approach we deliver complete, yet simplified and converged systems and solutions. The TEKEASE staff works closely with our clients to create new business systems environments designed to maximize the efficiency and productivity of the technology. We help our clients incorporate the best technology practices in design, delivery and management of voice, video, data, network and business systems. TEKEASE provides solutions which converge all of a clients business technologies to optimize workflow, staff management, field and back office business systems. TEKEASE is a rapidly evolving technology services company with a focus on providing complete technology solutions to small and medium-sized businesses. TEKEASE is committed to preserving the environment in every aspect of our business through the programs we provide, leveraging technology to train our clients and minimizing travel and waste whenever possible. TEKEASE and our employees believe that part of being a successful company is also being socially responsible. Our entire team is committed to local support of the people and communities we serve. Our team brings a wealth of management talent and experience to running TEKEASE. The biographies and perspectives of our management highlight their valuable expertise and insights. TEKEASE leverages every aspect of network ubiquity in voice, video, and network solutions available to provide our clients with the greatest level of access. All of our programs incorporate top-of-the-line technology which makes every communication meaningful and engaging.